"The cosmos is all there is, or was, or ever will be..."
I still remember feeling a keen sense of anticipation as I sat down to watch the first hour-long episode of the PBS series, Cosmos: A Personal Journey (September - December 1980). I was in the fifth grade at the time -- just ten years old -- and my English teacher, Mr. Rice, had assigned me to "review" the premiere episode, "The Shores of the Cosmic Ocean." It was my first written TV/film review of many, I suspect...the inauguration of my own "personal journey," as series host Carl Sagan (1934-1996) might have aptly described it. I recently re-screened the first episode of the award-winning Cosmos, "The Shore of the Cosmic Ocean," and it was amazing and gratifying to me how many ideas, how many visuals, how many specific moments I recalled with clarity, nearly thirty years later. "The Shore of the Cosmic Ocean" opens with a view of tumbling, crashing waves, and then a long-shot view of a solitary man on a mountaintop. As this figure nears us, this very intense-looking man garbed in a red turtleneck and corduroy jacket begins to speak in forthright, blunt terms about the human race and our place in the universe. 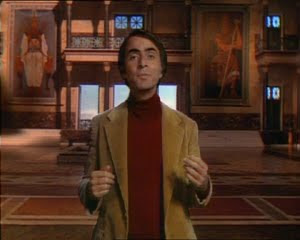 Meet Carl Sagan, our host, teacher, and philosopher-in-residence. He speaks explicitly of the danger of the Cold War and our new found technological capacity to destroy ourselves. But he also notes appreciatively that, as a species, we are "young, curious and brave." What will follow this introduction, he states, is nothing less than the story of us, of humanity, floating "like of mote of dust in a morning sky." After reminding us that for this TV journey we will require "imagination and skepticism both," we then board "a ship of the imagination," a glowing star craft that resembles a dandelion seed. Next, we travel alongside our host for a close-to-thirty-minute voyage through the universe. We visit quasars, pulsars, a supernova, a stellar nursery, various galaxies ("chains of islands in the cosmic ocean") and more. We see the Orion Nebula, the Hercules Cluster, Andromeda, the planets of our solar system large and small, and then set a course into "the shallows of the solar system," where we finally reach blue, clouded Earth. This great, beautifully-rendered sojourn through galactic space ends pointedly with a montage of human faces, one that reveals us in all our great diversity and all our great similarities. 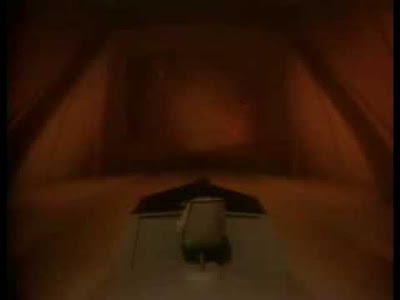 This entire segment features a trippy 2001: A Space Odyssey (1968) quality, with host Sagan at the lonely control panel of a vast, minimalist-looking space ship bridge, staring into a huge view-screen. The evocative, emotion-provoking Vangelis musical score adds to the aura of portentous discovery, and even the narration (written by Sagan, Ann Duyan and Steven Soter) boasts a lyrical, poetic quality. Sagan speculates about alien life forms; about their politics, music and religion. He wonders if alien races, like humans, pose a danger to themselves. His every word is, without exaggeration, mesmerizing. Yes, Cosmos is an educational program produced in 1979-1980 for Public Broadcasting, but it has such a distinctive feel and mood. Some less-than-generous souls might term the vivid language a tad florid, but I disagree. Sagan loves words -- loves the act of communication -- as much as he loves science here. Therefore, his mode of transmitting fact and speculation is both colorful and individual. This is his "Personal Journey," the series announces; the equivalent, perhaps, of a modern-day vlog, in some weird sense. 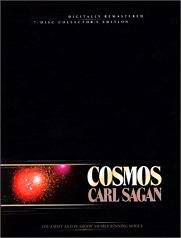 So indeed it is appropriate Cosmos should be stamped with Sagan's persona, his unique and dramatic way of both seeing and saying things. After disembarking from our "ship of the imagination," Sagan next time-travels back to the Great Library of Alexandria in antiquity, "the brain and glory of the greatest city on the planet Earth." Thanks to some 1970s-era blue-screening composited with miniatures, we actually see Sagan stroll through the corridors of this great "citadel of human consciousness," telling us of the over one million scrolls of knowledge it once housed. It is right here, says our host, that Euclid studied and learned; that Archimedes pondered; that Ptolemy contemplated the stars. In detail, Sagan relates how another user of the great library, Eratosthenes, calculated the circumference of the Earth...and was pretty darn accurate in his estimation. This particular segment of Cosmos reminds us of humanity's capacity for greatness. "The drama of the human species," as Sagan would say, is about our curiosity, our quest for knowledge, our unending capacity to grow, change and adapt to our new understandings about the cosmos. The final bit of "The Shores of the Cosmic Ocean" is downright humbling. Sagan leads us to a giant calendar displaying the twelve months of one year. Then he describes "cosmic time," stretching from the Big Bang...to now. The human portion of that calendar, Sagan says -- our entire recorded history -- fits into the last ten seconds of December 31st. Before that, perhaps, we were just "star stuff." As Sagan is visually "zapped" or "beamed" into this cosmic calendar, I registered again how cleverly Cosmos deploys special effects. This is no dry science show; no emotionless recitation of dull fact. It is -- as promised -- a kind of imaginative, speculative journey rendered dynamic through up-to-the-minute, state-of-the-art visuals (for 1980, of course...). This first episode of Cosmos culminates with Sagan's suggestion that a new calendar year is about to commence, and how long our dominion lasts in that new year will depend on which of our human qualities wins outs: our tendency towards self-destruction; or our curiosity and need to acquire ever more knowledge. 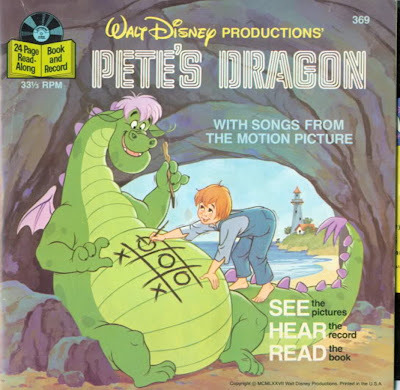 Other segments of Cosmos include "One Voice in the Cosmic Fugue," "The Harmony of the Worlds," "Heaven and Hell," "Blues for a Red Planet," "Traveler's Tales," "The Backbone of Night," "Journeys in Space and Time," "The Lives of the Stars," "The Edge of Forever," "The Persistence of Memory," "Encyclopedia Galactica, "and "Who Speaks for Earth?" Yet it is this premiere that I recall most vividly so many years after the initial broadcast. Sagan had a way with words, and a personal mode of contextualizing the cosmos in distinctly human terms. Nothing lasts forever, "not even stars," he tells us, reminding viewers that mortality is universal. The series Cosmos won't last forever, either, but after thirty years, Sagan's intellectual curiosity remains irresistible, and his exploration of "all there is, was or will be" is both valuable and illuminating. I'm definitely going to get this series for Joel when he is old enough to appreciate it. Why? Specifically, Cosmos, though educational in tenor and approach, is actually dramatic, even enthralling, in a unique way. It boasts an unending sense of wonder about everything, about the order of the universe. And today -- in the era of seemingly "billions and billions" of dark science fiction TV series -- that sense of limitless imagination, that sense of renewed marvel and optimism makes Cosmos not a just a retro-curiosity, but a beacon in the night as bright as a pulsar. Like the classic Trek, Cosmos had a profound impact on my intellectual development. It seems that you did not find it to be dated. My son is eight, what do you think is a good age to turn him onto Cosmos? Thank you for this emotional journey back in time! I grew up reading Sagan's "Contact" (the source for the enjoyable, though inferior, 1997 Zemekis film with Jodie Foster) and reading the print version of "Cosmos". When I finally managed to get my hands on the DVDs, years later, and despite the fact I was no longer a wide-eyed teenager who marvelled at new discoveries, "Cosmos" the TV series mesmerized me! Something about Sagan's passionate and self-asserted voice and the perfect marriage between poetic voice-over and awe-inspiring visuals really did it for me! I don't think there's an age after which "Cosmos" is too naive for you. But beginning at 8 or 9 does sound right. My local library actually has the entire set on dvd, so I was lucky enough to have watched the entire series again recently. I too recalled the very first time I saw it as a child, and it was just as captivating for me now as it was then. He really had a way of capturing your imagination with each word. He offers the song free to download (in lossless flac no less! ), along with a video (which is awesome). He also makes it available for purchase on vinyl! Definitely check it out!